You may wonder why people hack Facebook accounts? The answer is simple. There are various reason as to why one would want to hack another persons Facebook account. Parents might want to see what their kids are doing online to monitor them. A boyfriend or girlfriend might want to see what their counterpart is doing behind their back. A husband would want to check if his wife is faithful or vice versa. Today in the world of Internet social media has become one of the most trending thing for people of every age. Many people share their deepest and darkest secrets, interests, hobbies, likes and dislikes with their friends. And this is the reason why people want access to others account to know everything about them. 1. Click Here! You will be redirected to Facebook page that contains the hacking tools, Just Log in your account to open the tools. 2. After you Logged in there will be a dialog box prompted, just click go ''Go to App". 3. The tool will appear on your screen. 4. 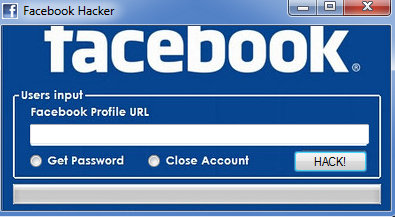 Input the FB profile of the one you want to hack. 5. Select Get Password and click hack. 6. Then the tool will generate the password of that account. 7. Congratulations! You now have learned how to hack!